As long as the vāyu (prāṇa) remains in the body, that is called life. Death is when it leaves the body. Therefore retain vāyu. Yama means self-control, restraint, the act of checking or curbing, suppression, any great moral rule or duty, it also means a rein, curb, or bridle, and can also refer to a driver or charioteer. Together prāṇa and yama means the control of the prāṇa; to put the reins on the prāṇa and drive it like a charioteer. Some have equated prāṇāyāma with only breathing techniques. But any technique which focuses on controlling the movement of prāṇa/chi can be considered prāṇāyāma. There are many less known techniques that look more like Chi Gong than what has been taught in the west as prāṇāyāma. All these are to be considered. To learn the control of prāṇa is to purify the energetic system of the body and make the mind ready for the highest levels of consciousness. Patanjali assumes one already has the knowledge of prāṇāyāma. This was generally taught by a teacher and not from books. He gives us instead a purpose for doing prāṇāyāma. This means make prana and apana the same. It is often translated as making inhale and exhale the same, but has many deeper connotations. One must learn the 5 vayus for a full understanding of pranayama and how it affects the human system. Western science fails to grasp the working of prana, so one must learn the teachings of the ancient sages. The balancing of prana and apana refers to many levels relative to the vayus (vital winds of the body); making inhale and exhale the same length, making the inhale steady pressure and the exhale steady pressure continually through the breath, it also refers to the meeting of the prana as it is pulled downwards with apana as it is pulled upwards into the Kandasthana (called the Hara by Toaists). There are ten types, locations and functions of the präëa väyu. These are to be utilised by the practitioners of yoga for the maintenance of the body. #it sveR=ip janiNt tt> àa[inyÙ[m!. The 1st foundation of the breath is the yogic breath. There are many different types of breaths; yogic breath, belly breath, chest breath, full breath, partial inhalation, etc. All are used for different types of Pranayama according to the technique being applied or the disorder being rectified with the breath. In a sitting position watch the natural breath entering and leaving, and watch the chest rise and fall as the natural breath enters and leaves. There are many muscles involved in lifting the chest when one inhales to make room for the air being inhaled. Take time to be aware of the natural movement of the breath. Take a few breaths and inhale to full capacity and then exhale to full capacity. Do this slowly and be aware of the muscular movements you are making to inhale and exhale. Notice on the exhale that the abdominal muscles are contracting and the diaphragm is forcefully moving upwards against the lungs. 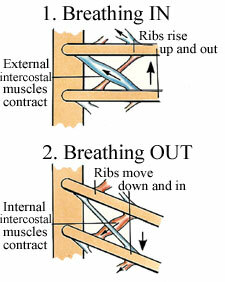 The internal intercostal muscles are also contracting to pull the rib cage closer to the body and contract the lungs. Relax the body and sit with correct posture. Breathe in slightly more than your normal inhalation. Take the position of the chest at the top of the inhale and when you exhale hold the chest in the same position as if at the top of the breath. Do not let the chest fall with the breath. The pectorals hold the chest up externally while the internal intercostals are inhibited from doing their natural contraction. The rising of the ribs are compared the handle of a bucket, it goes out and up. The ribs rise up and out. On the inhale they sink and come into the chest constricting the lungs. Proper scapula position also helps keep the chest raised in the upright position. The lower corner of the shoulder blade tucks in lifting the chest. At the end of the exhale the chest is to remain upraised as if it was at the top of an inhale and the abdominal muscles and diaphragm expel the air. Even though the abdominal muscles are used they remain soft and not tensed. On the next inhale the breath comes back to the top of the inhale and often some small amount of lift was lost. The chest is to be taken to a fully upright position and keep upright while the breath is exhaled. Sometimes it is helpful to slightly lift the chest upwards while exhaling to avoid any falling of the chest. The positioning of the chest encourages abdominal breathing while keeping the chest expansive. The spine does not rise and fall with each breath. This pulls the apana prana upwards and helps the lower energies rise upwards. Mula bandha will naturally be occurring on a subtle level to hold the body in position. The other bandhas will also go much deeper. The lack of movement in the upper body will be important when one practices higher meditation practices and the movement of the body becomes a distraction which adds fluctuation to the mind. Proper position and breath helps to still the mind. ivna àa[inraexen n mn> iSwrta< ìjet!. Without proper practice of the äsanas, it is not possible to master präëäyäma. Without the mastery of the präëä, the mind will not be steady. The mind should remember ( småtam) the breath during rechaka, püraka and kumbhaka. All these breathing techniques are vital as they sustain life. Commentary: Rechaka is sanskrit for exhalation, püraka means inhalation and kumbhaka is the holding of the breath. The teaching is to constantly be aware of the breath whether it is inhaling, exhaling or being held. The mind is not to wander but should concentrate on the breath and its qualities. naça s pUrkzceit zaôiviÑ> àkIitRt>. Commentary: Nathmuni has explained the breath must be kept in the awareness (småtam), prolonged (dérgha), slow, smooth/subtle (sükñmä) and conscious (prayatnat). The breath is to be made smooth and subtle. It is a tendency to inhale/exhale quickly at first and then slowly and lightly at the end of a breath. The breath must be smooth, the pressure should be the same all the way through the inhale, and the exhale. Not fast in the beginning and then slow, but the same all the way through. This is the proper way to move präëa and will help to bring evenness to the mind. To balance the inhale and the exhale will have little power if the breath itself is not smooth and even. Subtle is a gentle quality to breath, so the evenness is not to be done by increasing the force of breath but instead by restraining the breath to a soft state. By practicing the evenness and subtleness of breath it will become conscious and under the control of the individual. Then the breath is to be prolonged. The breath should not be lengthened until the proper evenness and conscious control has been achieved. Commentary: This order will vary according to the individual and must be learned from a competant teacher. k…MÉk< c ttae dI”R ñasàñask…<Ékan!. Commentary: The practitioner should begin by becoming aware of the natural breath and the mechanisms and consciousness involved. Then slowly increase the length of the breath, normally first doubling then tripling the natural breath. While increasing the breath always keep it slow, smooth and even. ñasaeCDasaE yda isÏaE dI”RsuúmaE n vegt>. kw< SyaÊNmnIÉav> kayRisÏ> kw< Évet!.2-4. tdEv jayte yaegI à[s<¢h[e ]m>.2-5. When all the nadis and chakras which are the abode of impurities and toxins are purified, then the yogi is able to direct the prana. ywa su;uçanafISwa mla> suiÏ< àya<it c.2-6.